The grounded canal boat in the Ribble seen from the lifeboat in daylight on the afternoon of 27th July 2017. The Lytham St Annes Mersey class All-weather Lifeboat (ALB) Her Majesty the Queen responded to a request to launch on Thursday 27th July 2017, just eleven hours after their last service had ended in the early hours of that morning. H.M. Coastguard requested the lifeboat launch shortly after 3pm when a canal boat crossing the Ribble Estuary from the Lancaster Canal to the Leeds-Liverpool Canal ran aground in blustery conditions and a strong flood tide. Concern for the two occupants, a husband and wife, was the main worry for the Coastguard as they were unable to refloat the vessel by themselves. The lifeboat with Coxswain Gary Bird in command, headed seven miles upriver to where the boat was aground near the River Douglas mouth. 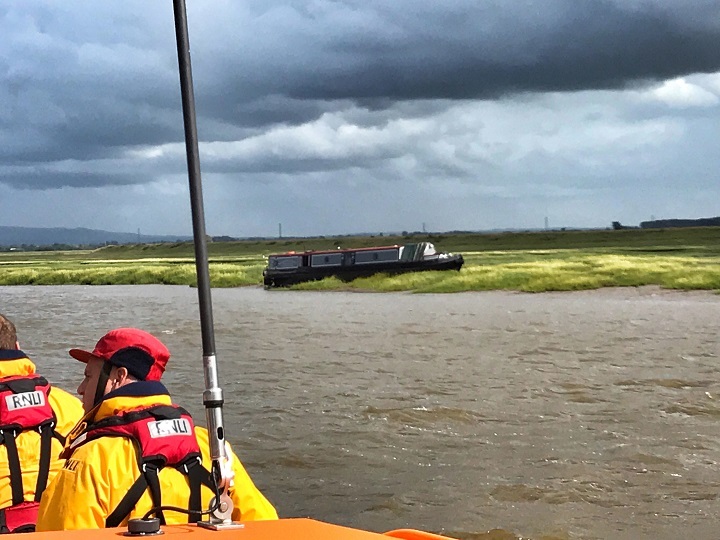 The vessel was found to be well up the bank on the south side of the Ribble near the Astland Light with no chance of being refloated as the tide was by now ebbing rapidly. After the safety of the occupants was ascertained and arrangements made to return on the next high tide, the lifeboat returned to her boathouse, arriving home at 5.15pm. Another early morning launch followed on Friday 28th July as the Her Majesty the Queen set out for the second time to the casualty at 1.45am in a south-westerly force 6 to near gale force 7 winds and the spring tide flooding in. As the lifeboat passed Lytham Town the Station’s inshore lifeboat (ILB) MOAM was also launched in the shelter of Lytham Dock with Helmsman Dave Hillier in command and accompanied the All-weather lifeboat to the casualty. Further up the estuary some shelter was afforded by the river banks. Timing their arrival at the canal boat to shortly before high water, the two lifeboats began to rig a tow line and three crew members, one from the ILB and two from the ALB were transferred to the casualty to assist in the refloating. In a text book operation despite the poor conditions, the lifeboats safely pulled the canal boat off the bank and took her in tow up the River Douglas to a secure berth at the Douglas Boatyard at Hesketh Bank. The two lifeboats returned together back down river in unpleasant conditions as the strong wind against the by now ebbing tide kicked up a nasty chop on the estuary waters. Off Lytham Town the Inshore lifeboat peeled off to be recovered ashore in the comparative shelter of Lytham Dock at 4.20am, returning to her boathouse at 5.10am. The All-weather lifeboat carried on down river, beaching opposite her boathouse at 4.30am with the first glimmers of dawn lightening the eastern sky. Washing off and refuelling took place leaving the voluntary crew free to return to home or work by 6am. ILB crewman Will Bridge added, “The canal boat occupants expressed their gratitude when they were safely berthed at the boatyard out of the dangers of the estuary”.